9 Volt Battery in a New Pedal - Do You Expect One? A few people have asked for a rundown of how TZF2's features differ from the original Paradox TZF (now referred to as TZF1). What follows is a list of everything I could think of. Slimming down the original design wasn't easy - I love all those features. So I made a compromise. I got rid of some features to save space, and I added a couple to make up for it. 1) TZF1 has stereo outputs, TZF2 has a single mono output. The stereo outs on TZF1 are comprised of the direct signal at both outputs mixed with the effected signal. The stereo image comes from the effected signal appearing at both outs with one side's polarity inverted. For a proper stereo image, you must dial in the audio mix so it includes direct signal and modulated delay. This is the principal behind most modulation effects with a mono input and stereo outputs. As you turn up the TZF knob (fixed delay level) you will hear the through-zero sweep. TZF2's output is mono. The output is made up of the fixed delay mixed with the modulated delay. There is no direct signal present at the output. 2) TZF1 has jacks for external SPEED control and MANUAL control. Use an expression pedal to control the SPEED setting or the MANUAL setting, or both. TZF2 does not have jacks for external control. Instead, it has the momentary RAMP button for manipulating SPEED and MANUAL. There is a selector switch for choosing SPEED or MANUAL. 3) TZF1 has a foot switch with two-color LED for selecting mix polarity. TZF2 has a small toggle switch instead and there is no indicator LED. 4) TZF1's audio mix section consists of one knob to mix between direct signal and modulated delay, and another knob to set the TZF (fixed delay) level. The most intense through-zero sweep happens when you dial in an even mix of fixed delay and modulated delay with no direct signal at all. TZF2 has a MIX knob that gives you the fixed delay signal when all the way down and an even mix of fixed+modulated delay when all the way up. There is no direct signal at the effect output, everything you hear has passed through an analog delay and its associated circuitry (pre/de emphasis, noise reduction). 5) TZF1 has a REGENERATION knob that creates positive or negative feedback depending on which way you turn it. This gives you some tubular flanging sounds, but it is not really part of through-zero flanging. For this reason, and to save space and keep things simple, TZF2 does not have a REGEN knob. 6) TZF1 has no volume knob, TZF2 does. 7) TZF1 uses a pair of audio relays for signal switching. TZF2 uses a 3pdt footswitch. 9) Learning curve. TZF1 has a reputation of being hard to dial in. This is because there is a lot of range in the controls and unless you really understand how the pedal works, you're in for a big learning curve (but the rewards are worth it). Good for someone who loves to tweak, but bad for someone who doesn't have the patience or desire to become a flanging expert. TZF2's features and control ranges are tailored to (hopefully) make it easier to dial in and to cut down the learning curve. 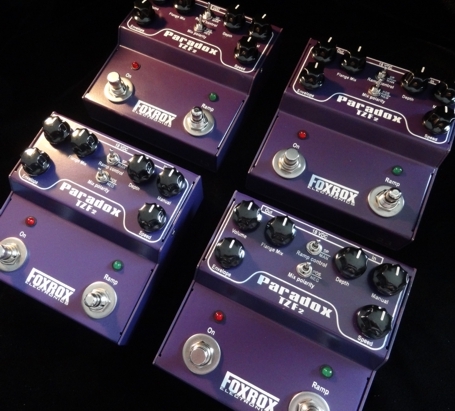 By the time I could afford to get a Paradox TZF(1), they were no longer available. I will most likely be getting one of the TZF2's, but I'm pretty bummed out that there's so many massive differences.. It's like a completely different pedal, and many of the features that I looked so forward to, have been removed or changed! ie. Stereo, signal mixing, expression pedal control, regeneration control, 18v power(!?!?).. all these are some of the biggest reasons of why I wanted this pedal, and what made it so great in the first place! I'm left crying out "why???" Really wish the TZF2 was stereo. I don't mind a difficult learning curve! I like having more features on a pedal, and I enjoy the process of learning how to use one, especially a REAL flanger. The TZF2 certainly appeals to me. The TZF1 is going for $600 now, when I can find one. I'm not going to pay that much for a pedal. Going to have to settle for the TZF2. Copyright Foxrox Electronics. All Rights Reserved.